And then there are the actors. Whole platoons of British players owe their careers to the war. Where would Jack Hawkins have been had he not flown with the Angels One Five across The Cruel Sea? 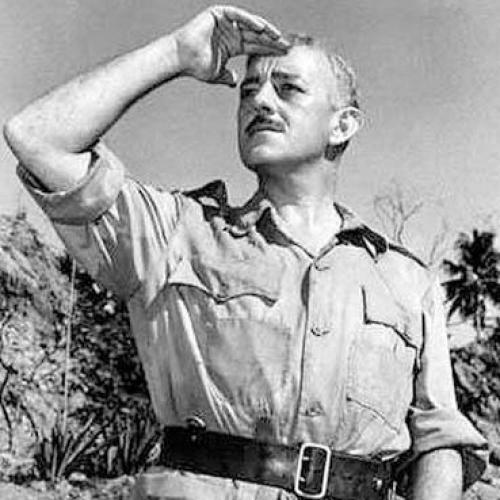 Whither Alec Guinness, who went one better by first incarnating Flight Lieutenant- and Colonel-types in Malta Story and The Bridge on the River Kwai and then playing der Fuhrer himself? Richard Attenborough, meanwhile, seems to have spent his life either directing or starring in flag-wavers. Certainly Attenborough crops up an awful lot in Howard Hughes’s book, a densely researched but dully written history of the movies that World War II engendered. Here he is as a “young seaman who panics and leaves his post without permission” in In Which We Serve, here as a “deceased RAF pilot” in A Matter of Life and Death, here as “cowardly civilian John Holden” in Dunkirk. And those are just the first three of Attenborough’s entries in Hughes’s text—there could have been many more. Hughes does not discuss all of Attenborough’s films, but had he found room to mention every picture about the war, a mention is all they would have received. Even as things are, the book offers little by way of probing analysis. A critic Hughes isn’t. Right from the get-go, when he tells you that The Battle of the River Plate “loses momentum when the story arrives in Montevideo,” you know you’re in unsafe hands. For all its documentary feel—such as its use of some of the vessels that were actually involved in the battle proper—Powell and Pressburger’s ship-borne shambles is dead in the water from the first frame. The duller-than-thou oafishness that Powell let John Gregson get away with, not to mention Anthony Newley’s shameful hamming, are totally overlooked, the better for Hughes to find room for another statistic about vessel tonnage or gun bore. Elsewhere in the book Hughes refers to Noël Coward’s “inimitable, clipped style,” though it cannot be all that inimitable because a few pages later we hear of Richard Burton’s “distinctive clipped Welsh tone.” This is critical boilerplate, though at least it is comprehensible critical boilerplate. When Hughes starts telling us that Roberto Rossellini’s masterpiece Paisa “depicts a realism” about the war in Italy, you begin to have no idea what he’s going on about. Like Wilde’s cynic, Hughes knows the price of everything and the value of nothing. If you want to know which films focus on what campaigns and battles, he is your man. If you want to know which real-life towns and villages and pubs serve as the backdrop to Went the Day Well and The Eagle Has Landed, he is here to help. But if you want to know whether a movie might be worth watching, he is generally way off-beam. Bad enough that Melville’s marvelously grimy movie about the compromises of resistance, L’ Armee Des Ombres, is glossed over in a brief paragraph. Worse that the same paragraph mentions Lewis Gilbert’s stiff-upper-lipped stinker Carve Her Name With Pride, as if the latter’s self-serving reveries are in anyway comparable with Melville’s all-comprehending vision. And what is one to make of a critic who in one breath tells us that Battle of Britain’s romantic subplot between Christopher Plummer and Susannah York does not “detract from the action” and in another that “for audiences with no interest in the battle, the pace is slow”? Still, argues Hughes, while the movie might be a dud, “for historians … it is … a treat.” Evidence for this claim is not forthcoming, though there is plenty on hand to prove that Hughes’s sense of the past is non-existent. History is never a mere narrative of events, of course. Hughes, who believes that “the right-wing Nazi Party’s emergence coincided with Germany’s economic depression in the 1930s” [my emphasis], might profitably spend time asking himself whether there is any relation between the two. The bigger historical point that Hughes misses is that the bulk of the British movies mentioned here were engaged in a war of their own. This was the postwar war of the prewar elite on the egalitarian New Jerusalem that the war itself was meant to have ushered in. For most of the 1950s, the average British film about the war was really a parable about the comforts and delights of a society demarcated by class. In film after film, audiences were taught that the lower orders are not to be trusted while faith in the upper classes is never to be questioned. Michael Caine once said that when he was starting out in movies you always knew that the villain would turn out to be the guy that chased girls. He might equally have said that you could always tell who the lazybones or the bungling incompetent or the sniveling coward was going to be because he would have a Cockney accent. Given the existence of such class-based character weaknesses, these movies argue, the postwar experiment in social democracy is bound to turn out disastrously. People who do not know their place are always having to be put in it by people who do. No movie can show you the way things really happened. War was hard enough to depict in Tolstoy’s day, but given the techno-turmoil of twentieth-century conflict such depiction has only become more difficult. The movies were born contemporaneously with modernism, but they have always fought shy of modernism’s love of abstraction, always clung to a Victorian faith in narrative objectivity. Nowhere in the movies will you find a vision of war’s hellishness to compare with that set forth by Picasso in Guernica, nowhere a vision of a world tearing itself to pieces to compare with that in Franz Marc’s The Fate of the Animals. Steven Spielberg made a good stab at it with the opening half hour of Saving Private Ryan, in which we see soldier after soldier being perforated by machine-gun fire or being decapitated by bullets that go right through their helmets. It is an awful half hour, a Boschian half hour, and the only properly moral response to it would be to leave the cinema. It would also be the proper critical response, since once the bloodbath is over we are obliged to wade through two further hours of maudlin mush as a few standard-issue good men put things right. The only war that has come out well of the cinema is Vietnam. The Deer Hunter caught something of the war’s Hobbesian hell, and Apocalypse Now may be the best cinematic rendition of the chaos of combat we will ever see. But both those movies conveyed the maddening incoherence of war by being themselves maddeningly incoherent. And they were helped to this incoherence by the fact that the war they depicted was a futile and meaningless one. Nobody could say that of World War II, although after watching some of the movies Howard Hughes chooses to laud in this silly book, they might be forgiven for believing they could.